Human short-term memory is notoriously frail, as everyone who’s ever misplaced their keys knows. Though it’s true that never before in history was our day-to-day memory tested with such an enormous amount of information that it had to absorb and retain in a very short period of time. Writing everything down is a good way to organize things you need to know but there is no need to hassle with paper and pen or even Stick-It notes anymore. Now is the virtual age and so we have virtual sticky notes. 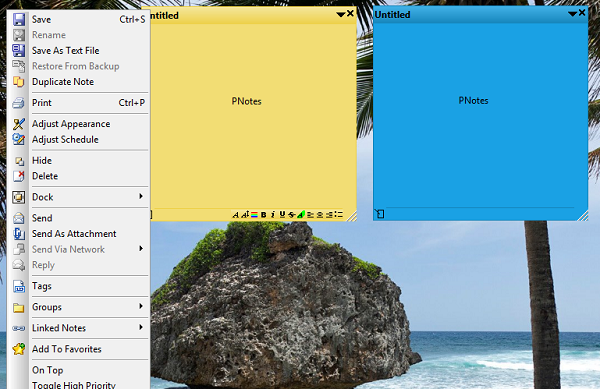 Stickies supports creating notes consisting of only an image, which you can edit on the spot. Stickies notes can be sent over the network to someone and quickly reply to received ones via email or Dropbox folder, making it work like an instant messenger. The “Friends” menu lets you organize and sort friends, editing their virtual addresses and using one of the function keys as a hotkey for each friend. You can hyperlink the text in the note and even Google it through the right-click context menu. The search engine can also be change in the options. All notes will be snapped to each other, neatly lining them up on the screen. Notes can be attached to any window, to appear only when that window is open. 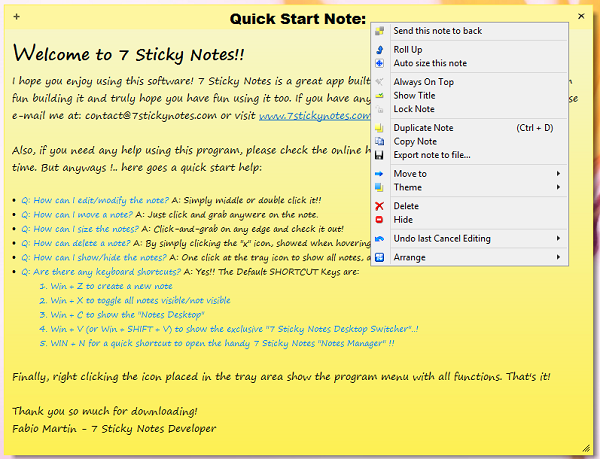 7 Sticky Notes setup will give you a choice between the standard installation and a portable one, which will extract all the necessary files to a single folder, ready to be run from a USB. Pressing Windows+C will show all notes on top of any other window. To stack notes on top of each other, use the context menu’s “Send this note to back” option. Desktop Switcher allows easy management of notes if you have more than one monitor. Windows+N opens the Notes Manager. It shows all notes present on the computer, including the ones in the Recycle Bin. Details: Free. Portable version is available. With Notezilla, it’s possible to search the text within notes for a keyword or a phrase. 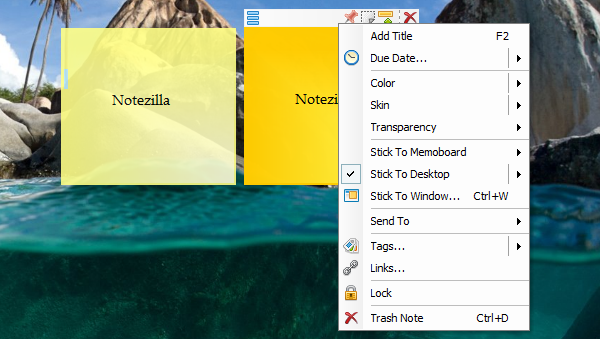 CTRL+SHIFT+Q will open the Notes Browser, wherein you can tag notes, add them to different memoboards, star or mark them as completed. Syncing is done via Notezilla.Net, a proprietary web service that will sync all your notes across computers, once you create and verify an account for it. The free version of Notezilla allows the creation of a standard account, but the paid version includes 1-year premium subscription, which allows for syncing of notes with smartphones and tablets as well. Details: Free trial, full version costs $29.95. Notezilla.Net 1-year subscription is $19.95. Portable version is available. There are two versions of PNotes – the regular one, with fewer features, and PNotes.NET, which requires .NET Framework 4 Client installed on the computer. Note files can be encrypted, as well as a separate layer of encryption for the text within them. Icons for different notes can be customized in the PNotes Control Panel. There is also a text-to-speech function as well as the option of synchronization via FTP. PNotes has the largest amount of formatting options – text can be superscripted and smileys, pictures and special symbols inserted into a note. All notes can be kept in sync via FTP. Details: Free. Portable version is available for both regular and .NET version. 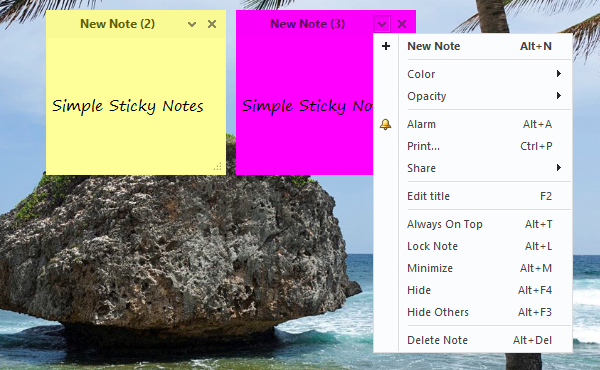 While the Simple Sticky Notes is running, ALT+N will create a new blank note, while ALT+V will also paste the contents of the clipboard into it. ALT+S will show all notes on the Desktop at once. Notes can be viewed in the Note Explorer, with each user on a computer having a separate notebook. Overall, this program has a very minimalistic set of preferences, it’s more straightforward and oriented towards user who want a program that simply works. 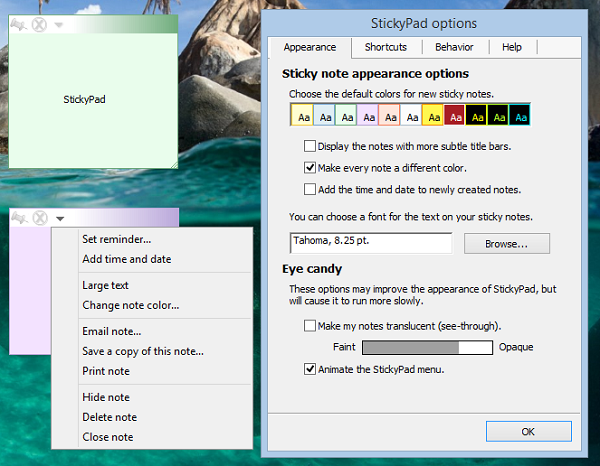 Simple Sticky Notes interface is available in 11 languages, including Dutch and Turkish. Extra note themes and alarm sounds are available via the website store and can be downloaded for free. With StickyPad, it’s possible to set reminders for individual notes, so they appear after a certain period of time or at a set date. By checking the box “Hide this note until then”, it’s possible to greatly reduce the clutter on the screen until the notes are actually needed. A left click on the StickyPad icon in the system tray will show the menu with shortcuts to the four most used programs, these by default being Windows Explorer, Calculator, Notepad and Windows Media Player. What these shortcuts point to can be changed in the StickyPad options. After installation, Hott Notes icon will appear in the system tray. A new note can be created in several ways: by pressing Windows+N, double clicking the system tray icon or right clicking it and choosing “New”. There are three types of notes available: Plain, Checklist and Scribble. Plain can contain only the text, Checklist creates a sortable list with checkboxes in front of entries, while Scribble allows you to draw with a free hand. All of these can be set to have an alarm, which will activate at a set time and either bring the note on top of all other windows or play an alarm sound. The text in a note can be formatted in size and font type. 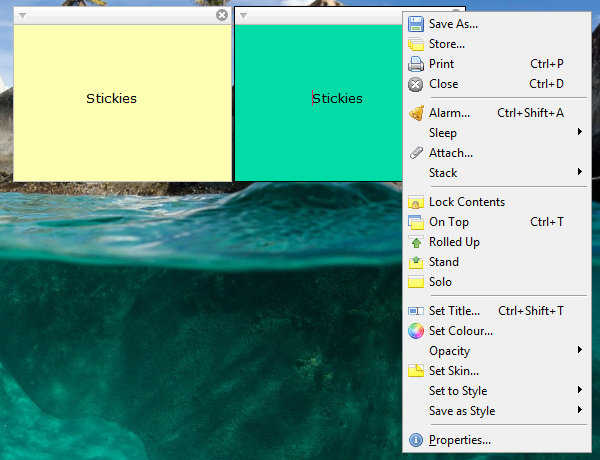 If you are content with Windows default Sticky Notes app, but wish to hide its icon from the taskbar, try Sticky Notes Taskbar Hider. 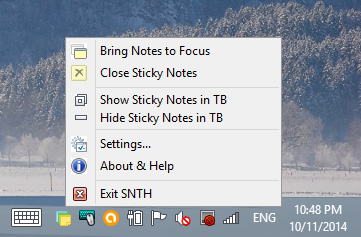 Simply install and select Hide Sticky Notes in TB to remove the annoying icon. We cover both free and paid software, as long as it is worth recommending 🙂 . Today M$ updated the Windows 10 Sticky Notes. I wonder what they did inside this new version. My guess is they are grabbing all our notes. It would be great to know which of this alternatives is the most secure. Is it maybe pencil and paper the most secure?